Sleep problems are common among residents of post-acute and long-term care (PALTC) facilities. Data suggests that age-related sleep changes, medical conditions common among older people, medications that affect sleep, substance use, and factors related to the long-term care facility environment all contribute to the prevalence of sleep difficulties in the PALTC population. 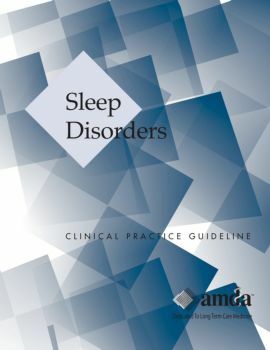 The CPG focuses on the evaluation and management of sleep disorders that are secondary to chronic medical conditions or environmental issues. Increased job satisfaction among caregivers.